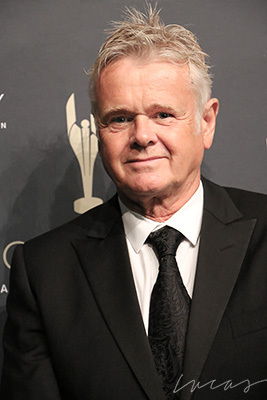 Sturla Gunnarsson at the 2019 Canadian Screen Awards © Ralph Lucas. (2003 – Toronto, ON) Born in Reykjavik, Iceland, in 1951, Sturla Gunnarsson has followed a circuitous path to success in the world of Canadian film and television, from After the Axe, which received an Oscar® nomination for Best Short Documentary in 1981, to the Genie–winning Such a Long Journey in 1998, with not a few American “made–fors” in between. The dramatic breakthrough he achieved with his respectable adaptation of Rohinton Mistry’s popular Such a Long Journey was followed by two knockoffs for American cable television: Ricky Nelson: Original Teen Idol (1999) and Dangerous Evidence: The Lori Jackson Story (1999). However, even in his television work there are outstanding samples of his finesse as a skilful director of dramas such as The Diary of Evelyn Lau (1993) made for the CBC and the more recent Scorn (2001) for CTV. 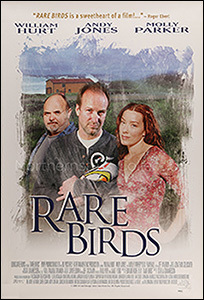 This poster for Rare Birds was scanned from an original in the Northernstars Collection. came up the big winner at the first annual Directors Guild of Canada Awards held in Toronto in October, with four trophies including outstanding achievement in direction for Gunnarsson. Not to rest on his laurels, his next project is nothing less than a $15–million adaptation of Beowulf, the eighth–century Anglo–Saxon epic poem based on Norse myths and legends. One has the sense that with Sturla Gunnarsson, the best is yet to come. Wyndham Wise: I understand that 100 Days in the Jungle and The Man Who Saved Christmas are airing at the same time in December. On the same night, December 15. I think it’s perfect. I’ll have a party and run both television sets with the sound on and play them together. 100 Days in the Jungle is on CTV and The Man Who Saved Christmas is on CBS. 100 Days in the Jungle is based on a true story about seven Canadians and an American kidnapped in Ecuador and held until a substantial ransom was paid. How did you approach telling this story? The thing about the story to me was the way the relationships evolved. Certainly, I didn’t have a hard time identifying with these men. Eight regular guys off to a sunny place for a few weeks work, make a few extra bucks, and have some fun. Suddenly, they have a gun to their heads, and they’re marched through the bush and made to endure this very unpleasant ordeal in the jungle. If you had asked them beforehand if they could have survived, the answer would have been “no.” What I tried to focus on was the specifics of the how. How the journey unfolded; how the relationship’s unfolded; the dynamics between these guys. A person who is the leader during a time of peace becomes inadequate in the time of crisis. It’s about how leadership emerges, and how the guys have to work together to survive. How they interacted with the guerrillas was important as well. Kidnapping for profit has become a branch industry of globalization. It’s the cost of doing business nowadays. If there is a kidnapping, there’s a certain drill that takes place and usually the kidnappers will have a satellite phone. It appears to have been a tough shoot. Half the time the actors are up to their knees in mud and it’s pouring rain at times. Part of the plot involves the asking price for the workers. Initially, the kidnappers were asking for $20 million, but eventually settle for some three million and change. What’s the price of human life? The guerrillas thought they were kidnapping Americans. The reason that it took them 100 days to negotiate the deal was because the negotiators had to lower the guerrillas expectations, because they had kidnapped Canadians and not Americans. Canadians aren’t worth as much. At one point the kidnappers realized that they had one American in the group, and they thought he would be worth more. He turns out to be Navajo. It puts the story into a realm where human life has value on the open market. What’s an Afghan’s life worth? What’s an American’s? Why did you choose to shoot in Costa Rica? The geography worked for the story. We were able to find the jungle we wanted and there is an infrastructure, and we were able to find people there who we could co–produce with and it felt quite comfortable. However, after September 11, everything changed. Getting anything into the country was a nightmare and customs went through everything, every single nut and bolt. Eventually, we had to appeal to the president’s office, and people were sent down to customs to get our stuff through. We didn’t get everything. None of our weapons got through, and we had to improvise. You certainly use a lot of guns, and there are plenty of weapons in the movie. How did you arrange that? Let’s just say they came from unconventional sources. There were a couple of fellows standing around the set until we finished with them. There was a Colombian connection. The kidnappers are never called by name. One assumes them to be members of FRAC, the left–wing Colombian guerrillas, but they seem to have no other motive than money. It was not a politically motivated kidnapping. It was kidnapping for profit and there are a number of groups in Colombia that are working freelance. Some are offshoots of FRAC, but not all of them. Actually, no one knew who these men were, they were never identified, and even when the men got back to Canada, nobody knew who their kidnappers were. What is the story behind The Man Who Saved Christmas, which you shot in Toronto for the CBS network in the States. It’s based on a true story of A.C. Gilbert. He was the Henry Ford of toys. He brought toy manufacturing into the modern age with assembly–line production. The story takes place between 1914 and 1919, the time of the First World War. He was the man who invented the erector set, which fits into the age of steel manufacturing and the emergence of sky–scrapers. It’s basically the story of how he, during the course of the war, converted his toy manufacturing to weapons production. In 1918, the United States Congress was proposing that the American people, instead of buying Christmas presents, should invest their money in bonds to support the war effort. Gilbert lobbied against that measure, even though he had converted his factory to make guns. He argued for maintaining the spirit of Christmas. Jason Alexander plays Gilbert and Ed Asner is also in it. This was an assignment–for–hire. It helps to pay for my Canadian films. Which brings us around to Rare Birds, your feature with William Hurt, Andy Jones and Molly Parker that was released early in 2002. How did you become involved with that film? It’s not your script. I feel very comfortable doing films that are based on novels. In a way, the novel represents to me in a fiction film what the raw footage represents in a documentary. You can build a universe, and I can get into that universe and find the narrative. Rare Birds is from an Ed Riche novel, and Paul Pope called me one day and asked me to read the book. He sent me a copy and I laughed when I read it. It’s very whimsical. I thought it really captured an essence of what I think of when I think of Newfoundland. These characters who survive adversity through their imaginations and intrepid spirit. I thought it very, very funny. I flew out to St. John’s to meet Paul and Ed. We spent a few hours together and got drunk, and realized we all got along just fine. For me there was kind of an affinity with my background in Iceland. There is a similar feeling on these two islands in the middle of the North Atlantic. I could relate to the geography and the psychology of the place. I agreed to do it, and Ed and I holed up in a hotel room over the course of several months and beat the story out. Ed comes from a radio background originally and is used to working on–the–fly. We would literally act the story out and we typed and over the course of several months, we came up with the screenplay. Would you tell me the story of Rare Birds for those who haven’t seen it yet? It’s about this middle–aged guy [William Hurt] who has sunk everything he owns into building a beautiful French restaurant in the middle of nowhere, to satisfy his artistic soul. He quit his previous job in New York, and his wife left him. At the beginning of the story he’s alone in his restaurant, drinking his way through the wine cellar before the bank repossesses it. His neighbour, played by Andy Jones, is a bayman, a Newfoundland bayman named Alphonse. He sees in Dave a kindred spirit, and he decides to help him. “Phonse” doesn’t want to see Dave go bankrupt and besides, he really likes his cooking. So he comes up with a scheme to report a sighting of a rare bird, and before they know it, the place is crawling with birders, flying in from all over the place to catch a glimpse of the non–existent bird. Of course, the restaurant gets up and running and the story goes from there. There are complications involving Phonse’s sister–in–law, played by Molly Parker, who comes to work for Dave as a waitress at the restaurant. He develops a lust for her, and there are further complications involving an experimental recreational submarine and a big bale of cocaine. Jones gives a stellar performance as Phonse. Andy is spectacular. The interesting thing is that, and I think this goes to the phenomena that sometimes cultures can’t see themselves up close, nobody in Newfoundland thought Andy was right for the part. This completely mystified me. I went for a walk with him out at Cape Spear, and I asked him if he would do it. He nearly fell over. He wasn’t expecting to be offered and said he would have to think it over, because the Phonse character is so far removed from him. He actually went and spent time in one of the outports near St. John’s and he agreed to do the part only if he could find a character to model himself on. Even the accent he is doing, it’s not his accent. It’s an east island accent, that Protestant strain you find in certain outports. He plays a bayman with a wild imagination. He has never built a house, but if he wanted to, he could and he would. The relationship between Hurt’s character and Parker’s is very warm and nicely underplayed. He doesn’t get the girl in the end, and in that way he seems another in the long line of English–Canadian cinematic losers. But you never know. He’s left chasing her as she leaves for Montreal. Recently your work has been in drama, like Scorn and Such a Long Journey, but I don’t recall you ever tackling a comedy before. I have never done a comedy before. At first I was a little bit hesitant. I thought, how am I going to do this? Then I thought: the novel is funny, and the script is funny, so I will play the film straight; ground it in the character’s emotional realities, and the humour will emerged. The relationship between Dave and Alice is interesting. I suppose you can criticize the age gap between the two. He’s middle–age; she’s considerably younger. However, I talked about that with Molly, and she wanted to play Alice as a mature woman, not a girl. The Alice character is so firmly in control of the situation. Dave doesn’t have a clue about what’s going on. He’s always one step behind, trying to figure it out. I love what William did. He’s not afraid to make a fool out of himself. He wasn’t afraid to be Andy’s straight man, which is what he essentialy is in the film. Andy gets all the laughs and William gets all the lines. Can you tell me what’s happening with the distribution of the film? It was released in Atlantic Canada with proper media support and it broke box–office records in Halifax and St. John’s. We were doing $14,000–per–screen average. There was no film in Atlantic Canada that was doing the same kind of business we were doing. But when it came to the rest of the country, it received an ambiguous release. We did okay, with strong word of mouth. It held it’s own and our second week was always better than our first. But I had friends asking when the film was going to open. You really needed a Geiger counter to find it. I guess you would rather had more promotion, like Men with Brooms? What you spend on promotion is what you make. Take a look at Men with Brooms. Basically, what they spent is what they made. If you happen to have a film that has legs and good word of mouth, and you do a serious spend on it, then you stand a chance at a breakaway hit. If you set your standards so low, and accept an eight–screen release, well, that’s not business. That’s a hobby. It has no cultural impact. People have to know the film is there, be aware of it, read about it. They have to hear about it. It has to become part of popular culture. If we can’t get beyond that, you remain in this zone of beautiful losers. We’re quite optimistic about the U.S. release. Roger Ebert is championing it. We’ll see what the Boston newspapers have to say. If it does well there, hopefully we’ll have a strong U.S. release. You came from a documentary background with two very well–regarded films made almost 20 years ago now; After the Axe in 1981, which received an Academy Award nomination, and Final Offer, which won a Genie in 1986 for Best Documentary. Now your work is entirely drama. If you look at Final Offer, which was the documentary that put me on the map—it got that Genie, also a Prix Italia and was named one of the Top Ten documentaries of the decade by the International Documentary Federation—if you look at that film, or for that matter After the Axe, when I was doing documentaries, I was also doing narrative. They’re not essay films, but character–based, narrative films. There’s a dichotomy between my political side and my literary side. When I look back on my films, they all seem to live in that world were the individual narrative is at the crossroads with the historical narrative. Such a Long Journey is very much that kind of film. It’s about one man’s crisis of faith, but it’s set in a very specific moment in India history, when the hope of a new India was dimming. There was the war with Pakistan over Bangladesh, and Mrs. Gandhi was proven to be corrupt. How involved are you with the writing of the scripts? With my films I’m involved from the start. I don’t write the screenplays, but I work with the writers right from the beginning. With Sooni Taraporevala on Such a Long Journey and with Ed Riche on Rare Birds. The Diary of Evelyn Lou was with Barry Stevens, and now I’m doing Beowulf with Andrew Berzins. Are you talking about ”the” Beowulf? Yes, that’s right, Beowulf, the Anglo–Saxon epic poem upon which every single Western you have ever seen is based. 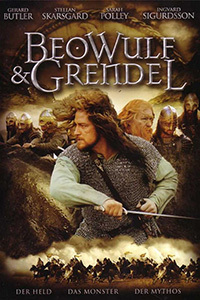 Beowulf was written in the eighth century by Christian Anglo–Saxon monks in England, but it deals with events that took place in the pagan Norse culture of the sixth century. It imposes a Christian morality on essentially a pagan tale. What we’re trying to do is reclaim the tale’s pagan roots. In our story, Beowulf is a hero who discovers his quest is not so noble. It’s about the function of a hero in a culture. Where are you going to shoot this? In Iceland. We have a co–producer, Fridrick Thor Fridricksson. He co–produces all Lars von Trïer’s films, and he is a top Icelandic filmmaker. He directed Angels of the Universe (2000) and Cold Fever (1994), and was nominated for an Oscar® for Children of Nature (1991). It’s a co–production between Iceland and Canada. Alliance Atlantis is on the Canadian side, and it has picked it up for a start date next year. Beowulf is an epic poem and very difficult to digest in its Old English. It’s the earliest written composition of such length in English, and indeed in all of Teutonic literature. There are university courses devoted entirely to this work. We’re only doing Beowulf and Grendel, the first half of the story. It’s set in a medieval time, but it’s modern in tone. It’s a grand epic tale: a medieval slasher with a literary patina. The purpose is to re–examine the hero myth, something that is essential right now, given the madness that is going on south of the border. I’ve scouted all the locations. We’re shooting in the eastern part of the country. It’s very rugged, and we’re building Heorot there. When Andrew and I had finished Scorn, we wanted to work together again, so we started talking and came up with Beowulf. We’ve been at it for three years now. For me, it’s a nice fit. Going to Newfoundland was a great experience, and doing Beowulf is a perfect synthesis of my Viking background and my Icelandic sensibility. 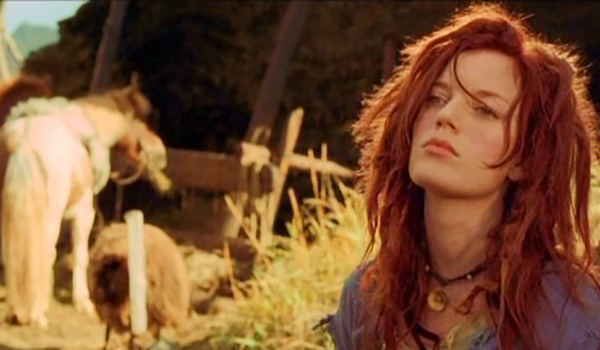 Sarah Polley as Selma in Beowulf & Grendel. Viking invasions and the oral tradition brought the tale to England where it was written down by an unknown poet, circa 700. In our version, the Danes will be speaking English, and Grendel will be speaking Icelandic. The monster Grendel is equally as important as a character as Beowulf in our story. We’re approaching Grendel as a creature that lives in the real world. The Christian interpretation of Grendel as the embodiment of evil is something we are going to question. Beowulf is connected to an Icelandic saga called Breckdesaga. In Breckdesaga, the morality is much more ambiguous. Beowulf is rather boring because the hero just does good things. There is no complexity to his character. In the saga tradition, the acts of the hero are sometimes barbaric and not justified. It’s certainly an ambitious film, but probably a lot of fun to shoot. I think it is going to be a tremendous amount of fun. I want to make an entertaining movie, one people will go and see. We can’t keep doing this [making feature films] as a hobby. It’s crazy. We have created this culture where feature films get tossed into the void. I want to break out of that mould. It’s part of the reason why I do American television, because it gives me freedom from Telefilm Canada. Did you look for American funding on this one? If I was to go that route, what I personally find interesting about the story would get stripped away. What appeals to them [producers in Hollywood] is the sword and sorcery, the blood and guts. What appeals to me is the examination of the hero myth, which is the most important debate we can have in the world today. We are on the verge of a world war. There is at least one leader, if not more than one, who believes he is on the side of God and that there are evil forces out there. It’s madness. We have this idea that evil is something that exists outside of ourselves. If we can put a black hat on it, or give it a mustache, or identify it as somehow outside of our own experience, then we don’t have to deal with it. I don’t believe in that. I believe evil to be a human construct, an idea we have created in order to describe certain aspects of the human condition. It’s within us all. Also see: Sturla Gunnarsson’s filmography. This interview was originally published in Take One Magazine, issue No. 40 in 2003 and edited for republication here in August, 2008. Wyndham Wise was the founder and editor-in-chief of Take One. Northernstars.ca acquired the archives of Take One in 2007. Dude, Are You Doing this Movie or Not?